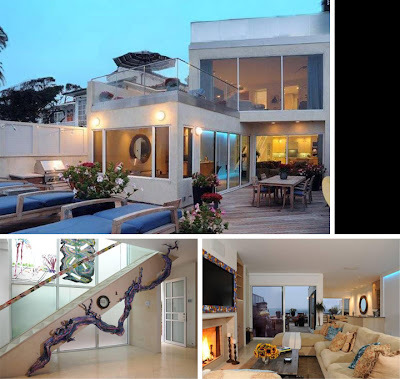 YOUR MAMAS NOTES: In June 2011 face-pulling comedian and actor Jim Carrey put his ocean front home in Malibu's guard-gated Colony enclave up for sale on the open market with an asking price of $18,000,000. * The modestly sized residence was de- and re-listed at least three times before it was taken off the market in late 2011. Your Mama (dissed and) discussed the five bedroom and 5.5 bathroom beach house back in June 2012 when returned to the open market with a significantly lower asking price of $13,950,000. In December (2012) the house was once again de-listed but none-the-less—we first heard from Yolanda Yakketyyak—it remained quietly available and property records reveal it quietly changed hands in late April (2013) for $13,400,000. The buyer's identity remains hidden behind a generically named limited liability corporation. Property records show Mister Carrey purchased the property in October 2002 for $9,750,000. Since the mid-1990s Mister Carrey's main residence has been a sprawling, solar-equipped multi-wing ranch residence with five bedrooms and nine bathrooms in 8,029 square feet on two park-like parcels that encompass more than two gated and high-hedged acres on one of Brentwood's better streets. In addition to the main house there's a substantial guest house between the swimming pool and the tennis court. Your Mama's research shows Mister Carrey acquired the first piece of his Brentwood bedsit in July 1994 for $3,800,000 and bought the adjacent vacant parcel in early 2000 for $1,700,000. Of course Your Mama don't know a spelling bee from a hog trot so we don't know what Mister Carrey's future real estate plans may be. However, the West Coast-based comedian has been on a long and well-documented search for a New York City residence and he seems to be smitten with very contemporary urban spaces. Several years ago Mister Carrey shelled out a pretty penny to lease an fishbowl-like apartment at the glassy, Richard Meier-designed tower at 176 Perry Street where—so the scuttlebutt goes—unsuccessfully attempted to purchase a full floor spread that was not listed on the open market. Back in October 2011 there were scads of reports that Mister Carrey visited a three bedroom, 2.5 bathroom, and two terrace duplex penthouse in TriBeCa's Zinc Building, then priced at $5,950,000 and now priced at $6.1 million (down from its original price tag of $7.25 million). A few months later the quirky Tinseltown jokester went for a much publicized look see around a 25-foot wide townhouse in the art gallery-filled Chelsea neighborhood. The six floor townhouse was originally built in 1824 but recently underwent a full-scale renovation that left with six bedrooms and six full and four half bathrooms in more than 7,000 square feet of of sleek and modern interior space that include a penthouse level solarium with a mostly glass roof and access to two terraces. At the time the townhouse was listed at $13.65 million but the price dropped precipitously to $8,999,000 before it was, a few weeks ago, put into contract with an unknown buyer for an unknown amount. More recently—well, a year ago—Mister Carrey was reported in the New York gossip columns to have toured the idiosyncratic and much ballyhooed quadruplex penthouse pad at the Clock Tower building in Brooklyn's expensively arty-fart DUMBO** 'hood. The apartment—also toured, they say, by professional basketballer LeBron James, fashion world icon Ralph Lauren and His Hip-Hop Highness Jay-Z—has 6,813 square feet on four floors with three bedrooms, 3.5 bathrooms, four exposures, and voluminous triple height ceiling over the dining room. It would appear Mister Carrey didn't cotton to the quirky crib since it's currently listed for $18 million. **That stands for Down Under the Manhattan Bridge Overpass, in case you didn't know. I bet he bought the Chelsea place..who can blame him. The price of the sale of his place and the asking price are similar too. That place used to be considered HUGE by Colony standards. I lived there in the early 80's, and most everything was still a little cottage. Super place. Great lines. Must agree with Mama's minor wonkiness points. My snarky peeve, gloomy-view windows -- easy fix with inside clear/outside dark film. Same result and not living like you have sunglasses on. Ooh, feeling all Bob Vela. Yikes. Three comments -- I can't help but think this has generated about as much interest as his last dozen or so films...IMHO, of course. As always LGB hits the nail on the head. Its tragic that those dozen or so films netted him 100s of millions I am sure. Its like Will Smith doing Men In Black XXVVI to cash a paycheck.